Local snowmobile clubs had a chance to get a birds-eye view of the areas they manage to see if sledders are entering prohibited areas. Gord Bushell and Teena Rumak, the general managers of the Eagle Valley and Revelstoke snowmobile clubs, recently rode along with the Conservation Officer’s Service on a helicopter enforcement patrol to see if the closure areas, monitored by the clubs to protect mountain caribou in the area, are being respected. 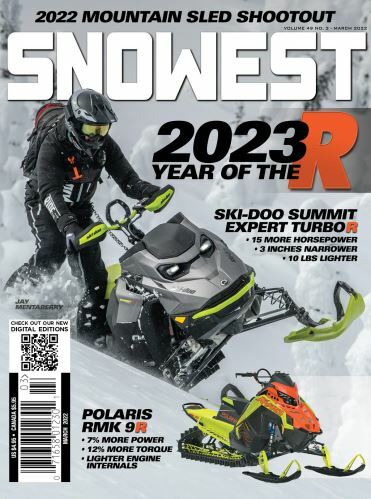 Bushell said local snowmobile clubs have signed stewardship management agreements which make them responsible for marking the boundaries of areas closed to snowmobiles due to the presence of caribou. Bushell said the enforcement trip was to look for sleds or sled tracks in closed areas. A flyover of Queest Mountain, where there had been non-compliance within a closed area in the past, turned up no sign of sleds or caribou. Bushell attributed previous non-compliance to signs being difficult to see. A flight over the Bourne Glacier, also managed by the Eagle Valley Snowmobile Club and closed to sledders except for a 20-metre wide trail to the top of the glacier, turned up some evidence of sleds straying into prohibited areas. A summary of enforcement action taken by conservation officers in the first half of March says they patrolled 10 caribou closures in the area north of Revelstoke and found good compliance overall, but one incident where sledders entered the legislated closure area on Frisby Ridge, and several others where the voluntary closure on the ridge was not being respected. As large sections of southern B.C.’s mountains are being considered for a legislated closure under the Section 11 of the Species at Risk Act, Bushell said it is uncertain whether the current stewardship agreements will remain in effect. Bushell said the Eagle Valley Snowmobile Club has not yet had a chance to speak with the people who will be making the decisions on further backcontry closures. He said they would like to have an open house in Sicamous to give the public an opportunity to get more information. A public consultation session is being held in Revelstoke on April 15 at a yet-to-be-determined location. Along with open houses, the B.C. government is also gathering public opinion on the closures online at https://engage.gov.bc.ca/caribou/section11agreement/. Bushell said he hopes an open house will let the province know about the effects the closures might have on peoples’ livelihoods. Bushell said while Sicamous does not have any large mills, many businesses in the area rely on the forestry sector. Sicamous is forwarding a resolution to the Union of B.C. Municipalities and the Southern Interior Local Government Association requesting adequate consultation be undertaken with the communities affected by the backcountry closures.